From Oxbow Powerhouse the Middle Fork of the American River drops to the confluence with the North Fork of the American some 24 miles down river, just above the Highway 49 bridge near Auburn. Rich with mining lore and opportunity for exploration by boat, foot or horseback, the Middle Fork American River Canyon is Spectacular. It was a well-kept secret for many years, until California whitewater rafting outfitters and enthusiasts recently rediscovered its beauty and excitement. The river has eroded the canyon's walls, exposing a classic section of the ancient bedrock and concentrating gold placer deposits in the riverbed, some of the richest in the Sierra Foothills." 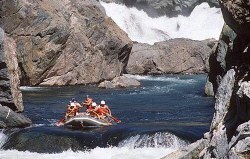 The Middle Fork of the American River runs through the scenic Sierra Foothills of Tahoe National Forest. "The Oxbow to Greenwood run is class III-IV with one Class V (Tunnel Chute) and should only be attempted with an advanced guide who knows the river, and crews of people with at least Class III river experience who are ready for a strenuous and sometimes dangerous river adventure. It is an order of magnitude more difficult than the South Fork of the American." This site provides information about the differen camping areas and access points for the Middle Fork of the American. Wilderness camping permits are required for camping along the river. The Middle Fork is a dam released river, so the flows can change from hour to hour. Conservation issues concerning the American River Canyons are also included. From Greenwood Bridge to Mammoth Bar is Class II. This site focuses more on the upper section of the Middle Fork American. For a mile-by-mile of the lower section, locate a copy o The American River, a recreational Guidebook written by Protect American River Canyons. Length: 15 miles to the Greenwood Bridge, 9 more miles to the Confluence of the North Fork American. Season: All Year, except in years with very low water runoff from snowmelt, when releases from Oxbow Reservoir shuts down from October till May. Gradient: 29 feet per mile to Greenwood Bridge, then 19 feet per mile to the Confluence. Runnable Levels: 900(lower for kayaks and canoes) to 4000 cubic feet per second. Difficulty is extreme above and below about 1,500 to 2500 cfs.